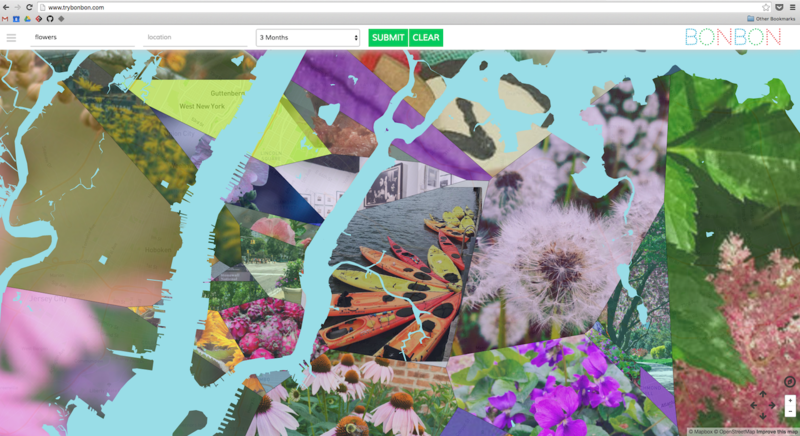 BonBon displays geotagged photos from Flickr and Twitter in a Voronoi diagram overlaid on a Leaflet Map. Users can filter by their chosen search term, time frame and location. Clicking on a photo displays a pop-up with address of the location and an option to share with a friend via text or e-mail, depending on the device. Trending data is available in a sidebar for any location. To build this app, we used React, D3, and SocketIO. Our sockets retrieve data from the server and broadcast it to the appropriate React components. We carefully used React's lifecycle methods to manage updating the map while minimizing the amount that had to be redrawn when a user zooms or pans the map. We used D3 to build the Voronoi diagram and display each photo in its corresponding cell.